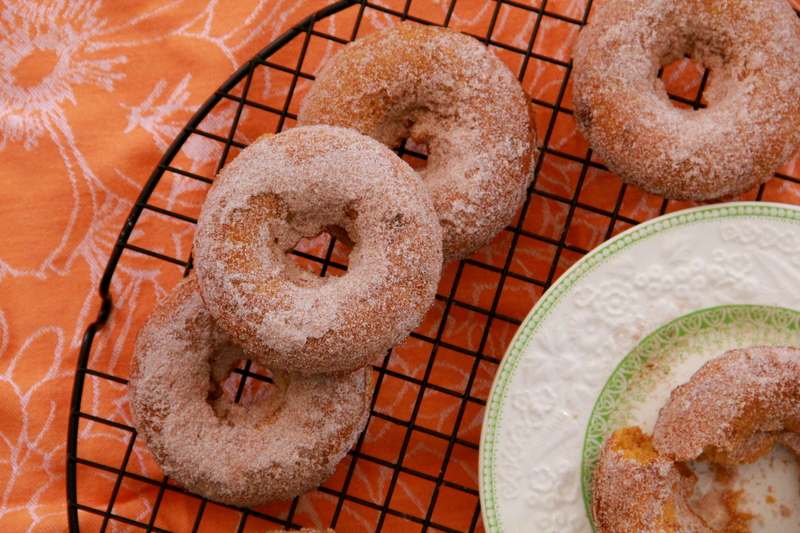 These doughnuts are baked and not fried, cinnamon-sugared and not plain, eaten and not saved. Both dunked and crumbled. Take the leap! Make some doughnuts. Write things, even if you feel silly writing them. Get up and out of the house. Take a walk. Wander. Travel somewhere far! If you can. Send somebody a letter. Like, in the mail. (The mail, mail.) What’s better than getting a nice letter written by hand? Talk to that guy you think is so-o-o-oo cute. Call him maybe. Pause for a minute. Look around. Ok, go. Wear something you think you can’t pull off. If you’re wearing it (and walking tall in those boots), you’re pulling it off. Use real butter. Just, please do. Be a friend. A real one. Everyone needs those. Just a few leaps to keep in mind. Mostly reminders to put yourself out there – socially, personally, professionally. Mentally? Sometimes I need a little extra push, a voice that says “go!” and “YOU can do it.” Because things don’t always work out, but sometimes they do. When they do, you’ll be glad you wrote that letter, or wore that skirt. And when they don’t? Well, then we get up, dust off, move on. And either way, there are doughnuts. These were inspired by Tracy from Shutterbean, a wonderful lady with a wonderful blog. 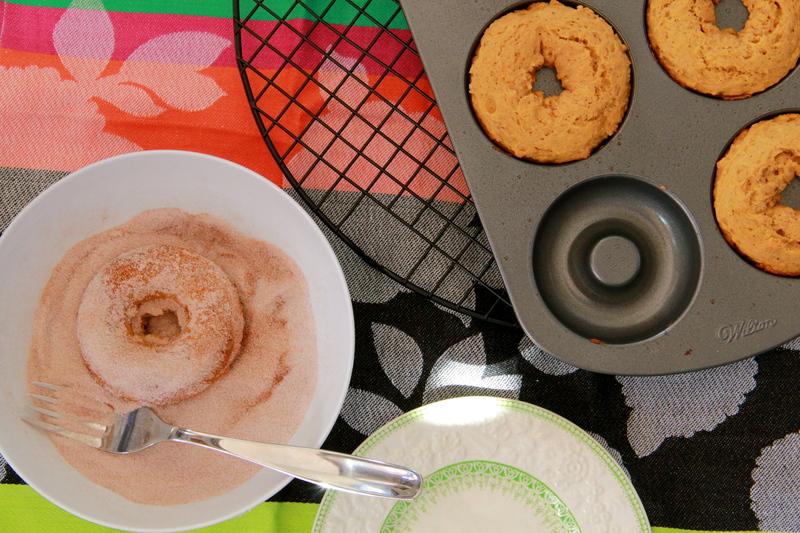 If you don’t have a doughnut pan, not to worry – just bake these in muffin cups instead, and roll them in cinnamon sugar while they’re still warm to get the doughnut effect (the recipe will make about 12 “doughnut muffins”). Heat oven to 425 degrees F. Spray two doughnut pans with nonstick cooking spray. In a large mixing bowl, whisk together the flour, baking powder, baking soda, cinnamon, allspice, nutmeg and salt. 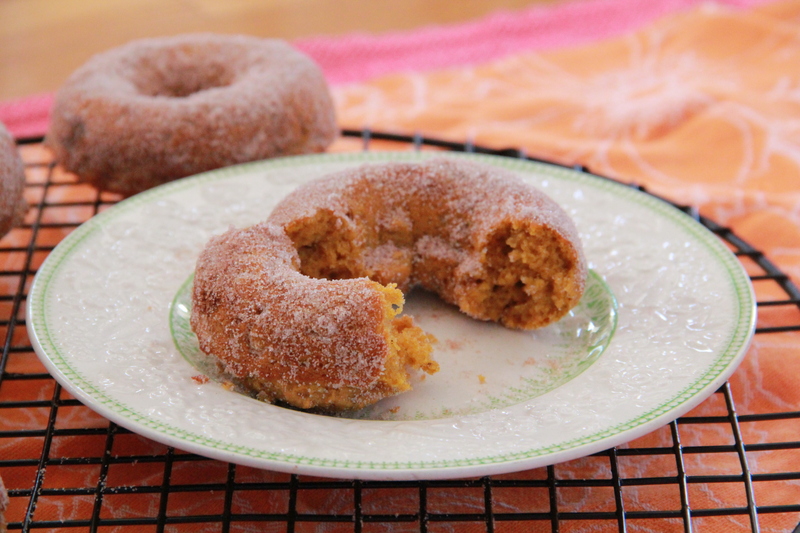 In a smaller mixing bowl, whisk together the melted butter, sugar, pumpkin and buttermilk. Add the eggs, one at a time, and mix to combine. Whisk in the vanilla. Add the wet ingredients to the dry, and mix until just combined. Fill each doughnut cup 3/4 full with batter. Bake doughnuts 8-9 minutes, until they spring back when touched. While the doughnuts bake, mix together the cinnamon and sugar in a shallow bowl. 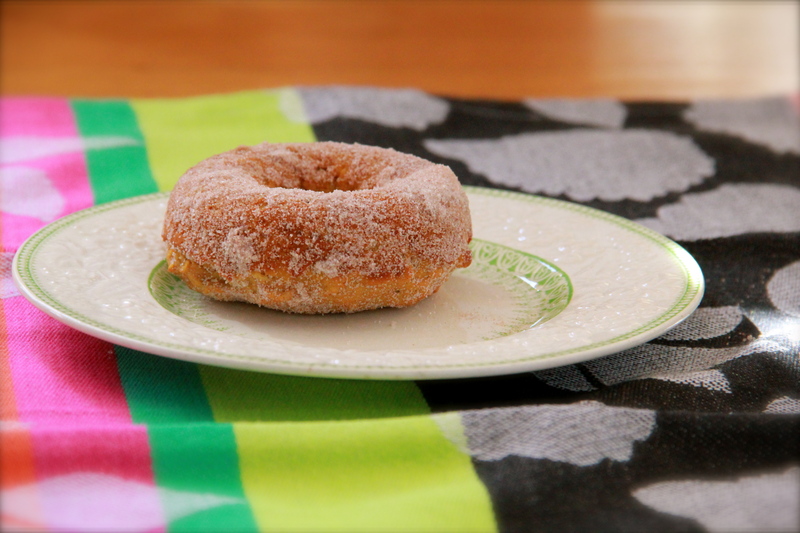 Once doughnuts are done, let them cool for 3 minutes in the pan, and as soon as they are cool enough to handle, roll them in the cinnamon sugar mixture (it’s important that the doughnuts still be hot, otherwise the sugar mixture won’t stick). Enjoy as soon as possible! Doughnuts are best served fresh. With coffee or milk or cider. These make me happy. If only I didn’t forget my donut pan at my parents house. ARG! this is my fave post ever. 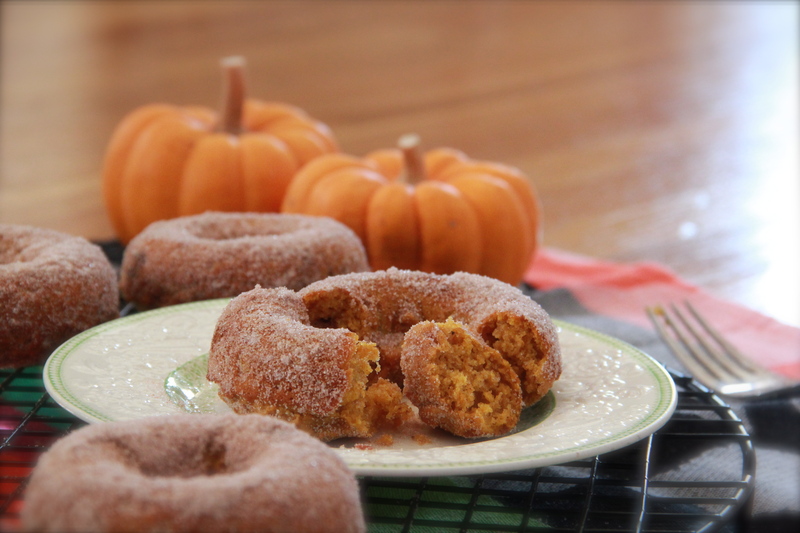 and i pumpkin donuts = my fave. wanna send one to nyc!?!? xo. Omgoodness! Those look so amazing. I’m so trying those this weekend. Your blog is awesome! Love the rolling pin logo. It was great meeting you on Sunday at Teahouse. 🙂 Hope you’re enjoying living here on the west coast. Found your site via Shutterbean and remembered that I really, REALLY need to make these doughnuts. They sound divine! Cute blog. 🙂 Love the little reminders. Alrighty then– I’ll write something right here! I am in India, living in a dormroom in a monastery (I’m not a monk, just a California girl in pursuit of some good old knowledge), and I don’t have an oven. In another life I was a pastry chef, and OH MAN, how I miss baking. I’ve been easing the ouch by reading your delectable posts all day (by that I mean during all the spare minutes I have between classes, hehe) and Ms. Molly, you make my day! Thanks for all the good spirits, good flavors, pretty pictures and general loveliness and food joy. Cheers! I’ve always wanted to visit India! Sounds like you are living the dream, girl. Thanks for reading!